Brief Synopsis: Guy Gardner's return disguises the appearance of another person familiar with a history with the Justice League. The narrative balloon, in the voice of the issue's mystery guest star, questions the integrity of Blue Beetle II and Booster Gold, wondering whether they are willing to make the ultimate sacrifice for a righteous cause. Readers of Countdown to Infinite Crisis #1 already know the answer to that question. As Booster and Beetle discuss Beetle's recent return to inventing, the narrative balloon suggests that their place in the Justice League was secured only through blackmail. Though that is not true, it certainly couldn't be put past either one of them. Booster, in particular, is an admitted thief and a liar. 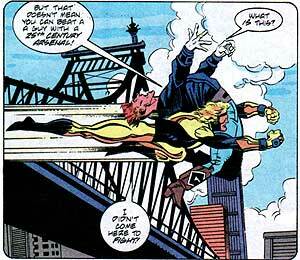 Booster interrupts the fight between Guy Gardner and Fire with a textbook flying tackle from behind. Booster uses his momentum to carry him through Guy, wrapping his arms around Guy's waist. In college, Booster was a renowned quarterback, but he tackles as well as a linebacker. The last time that Booster really fought Guy Gardner was in 1988's Millennium #6. At the time, Guy was suffering from a personality disorder and was easily dispatched. This time around, with his usual, surly personality and Qwardian power ring, things seem to be turning up Gardner. The fight between Guy Gardner and Booster Gold is interrupted by Superman. After several confrontations, it is still unclear which hero would win in a drawn-out fight. 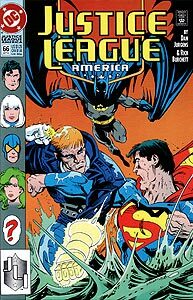 Booster Gold joins the rest of Justice League America (Bloodwynd, Blue Beetle, Fire, Ice, Maxima, Maxwell Lord, and Oberon) and Batman alongside New York's East River to watch the outcome of the fight between Guy Gardner and Superman. Boosterrific Review: An issue-long investigation of the direction of the contemporary Justice League ends in an unexpectedly pessimistic note, foreshadowing future plotlines. It makes for an engaging journey through the mindset of the members of the League.